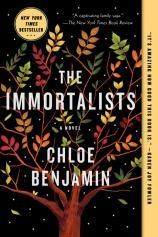 Several months ago, I had the opportunity to read an excerpt from Chloe Benjamin’s THE IMMORTALISTS. Ever since, I’ve been musing over the intriguing premise of the book and wondering when I’d have a chance to finish it. As I eagerly sat down to read the newly published novel, I realized that my own experience mirrored (in a much less profound and life-changing way) what Benjamin is actually writing about here. The novel opens in 1969, as siblings Varya, Daniel, Klara and Simon Gold, more or less on a dare, follow clues to the apartment of a psychic about whom they’ve heard rumors. The children, who have grown up in a largely Jewish neighborhood near their family-owned tailor shop on New York’s Lower East Side, initially approach the adventure as a lark, a way to break up the monotony of summer vacation. But when the psychic --- who purports to predict the day you’ll die --- meets with each child individually, the siblings are never the same afterwards. They can’t even fully discuss what they’ve learned with one another, even though (as the reader soon discovers) none of them can let go of the date they’ve been given --- and its potential significance guides the decisions each Gold sibling makes, for better or for worse. "I don’t want to give too much away, but suffice it to say that Benjamin uses her intriguing premise as a way to both develop and explore her characters, considering how each individual would respond and make choices based on the (supposed) knowledge of their final day." In four main sections, THE IMMORTALISTS fast-forwards to four different time periods, ranging from San Francisco in the early 1980s to upstate New York and California after the turn of the century. The book centers on each of the siblings in turn, as each one --- beginning with the youngest child, Simon, and ending with eldest sister Varya --- comes to terms with the date he or she has been given. In addition, their stories play out against a backdrop of cultural, political and scientific changes over the course of those same several decades, changes that also intersect with the family’s personal lives and relationships. I don’t want to give too much away, but suffice it to say that Benjamin uses her intriguing premise as a way to both develop and explore her characters, considering how each individual would respond and make choices based on the (supposed) knowledge of their final day. Some (like Simon) use this knowledge as fuel to choose a life of fearlessness, while others (like Varya) choose caution to a fault. The early death of their father --- whose passing precipitates the plot of Simon’s section --- is contrasted with the lingering decline of their mother, whose late-in-life embracing of her Jewish faith and practice also drives much of the book’s consideration of religious belief as a (possibly imperfect) antidote to the terrifying knowledge of one’s own mortality. THE IMMORTALISTS isn’t perfect --- one of the siblings’ stories tiptoes a little too close to melodrama to suit the relative realism of the book’s other sections --- but that’s a relatively minor flaw, one that hardly detracts from the many serious and important questions Benjamin raises throughout her story. These are questions that readers will find themselves returning to for weeks or even months after they’ve finished the novel.